Jason Anti Cavity Toothpaste features blue green algae (aphanizomenon flos-aquae), rich in calcium, proteins and antioxidants, to naturally strengthen your teeth and gums and potent spearmint and parsley extracts to keep your breath fresh and clean. Jason`s exclusive blend of natural polishers and stain-fighting botanicals includes bamboo powder, calcium carbonate and silica to help prevent tartar build-up while gently brightening your smile. For a strong smile and fresh breath, use Jason Sea Fresh toothpaste and mouthwash twice a day. Calcium Carbonate, Aqua (Water), Glycerin, Sodium Cocoyl Glutamate, Mentha Viridis (Spearmint) Leaf Oil , Carrageenan, Aloe Barbadensis Leaf Gel*, Bambusa Arundinacea Stem Powder, Carum Petroselinum (Parsley) Extract, Citrus Grandis (Grapefruit) Seed Extract, Chlorella Pyrenoidosa Extract, Perilla Ocymoides Seed Extract, Stevia Rebaudiana Leaf/Stem Extract, Silica, Sodium Bicarbonate. *Certified Organic Ingredient. Brush Teeth thoroughly, preferably after each meal, or at least twice a day, or as directed by a dentist or physician. Supervise children as necessary until capable of using without supervision. 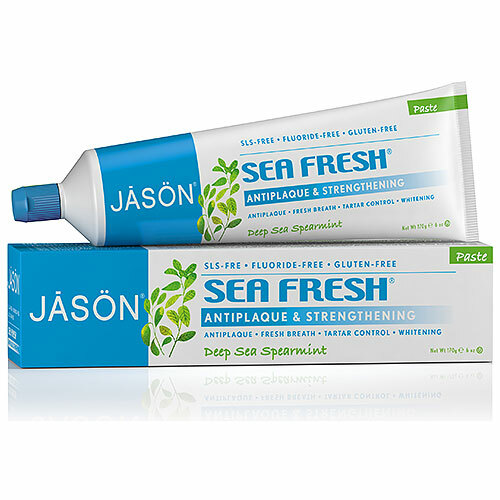 Below are reviews of Jason Sea Fresh Strengthening Toothpaste - 170g by bodykind customers. If you have tried this product we'd love to hear what you think so please leave a review. Top quality fluoride free paste! I have previously used Jason's "powersmile" paste (available here as well) and it was more expensive in our local 'healthy shop' (£7.50 over a year ago) but worth the money, same as this one - all natural, good for everyday use, works good bringing back the natural white and leaving very gentle fresh taste. Another great product from Jason, bodykind thanks for extending their range of products available in your shop! these are high quality and worth the money, also - you will not find better price online or in shops from what I know.